There are many KPI management programs out there for people to choose from, with various levels of complexity and functions for visualizing and analysing business data. However, there is one piece of data visualization software which companies rely on, yet is found in the majority of company offices: Microsoft Excel. Since it is possible to create charts to visualize your data, the question arises: Why should you use specialist KPI dashboard software over Excel charts? Excel is undeniably an excellent, almost indispensable part of any office. But, many companies have problems with Excel dashboards that specialist software addresses. 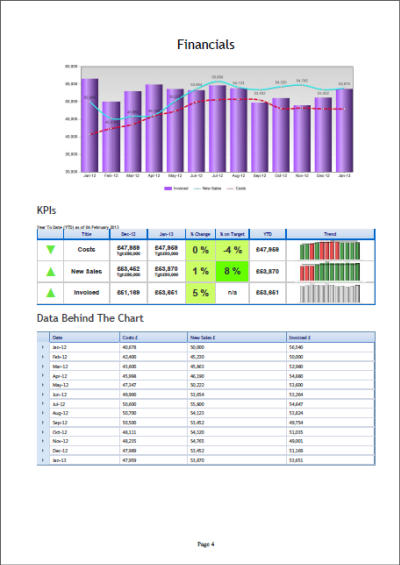 This article will show you what dashboard software has to offer over managing your KPI data from Excel spreadsheets. While Excel is great for performing calculations on a large set of data, it falls short when dealing with business KPIs. This is because KPIs need to be easily understood and analysed to make decisions; simply using a set of numbers to produce another set of numbers often leaves users wondering what they are supposed to be looking at. That’s why many use charts and dashboards to visualize KPIs, so that they can see trends and come up with their own conclusions. While you can create Excel dashboards from your data, clients have found it a lot easier to build dashboards from scratch in specialist programs, for a few reasons . a. Many Chart types available immediately. Creating charts in Excel often requires you to be imaginative to get what you want. While creating a simple bar chart with one KPI in it is quite simple, categorising that data can require the use of pivot charts and other tools. Creating a speedometer gauge, for example, requires you manipulate a donut chart (as in this video) , while gauges are readily available in most dashboard programs, ready for you to input and display your data.Our Dashboard Best Practice Guide has more KPI dashboard examples which you can take a look at. While gauges alone tend to have limited uses, this example shows that while Excel is great for lots of data manipulation tasks, specialist software contains tools which make your KPI management easier. When doing the latter, it’s definitely worth investing time to make your dashboards presentable and easy to read. However, when you’re trying to find answers yourself, creating charts just to view your data is a messy affair; you end up with a screen with lots of charts that you need to drag around to see properly. Most dedicated dashboard products offer a pre-made space where you can create charts and arrange them in an orderly manner with no effort at all. The amount of data measured and managed by companies differs depending on size and other factors. Many small to medium sized companies (SMEs) I have worked with managed their data from reams of spreadsheets, often using simple charts and dashboards created in excel to visualize it. One of their main complaints was the time it took to create dashboards using Excel, particularly for creating reports for clients. Current dashboard software can offer many ways to save managers time, allowing them to analyse their data for information, rather than fiddle with it to make it analyzable. While many dashboard programs let you create KPIs through calculations, most offer quick, efficient ways to manipulate your data without the need for complex formulae or procedures. For example, changing monthly data to quarterly data can be tricky and time consuming in Excel, though managers may need to quickly compare monthly and quarterly trends to make sense of data. Check out this video showing the different steps it takes to convert quarterly data into yearly data in excel (great tutorial, by the way). 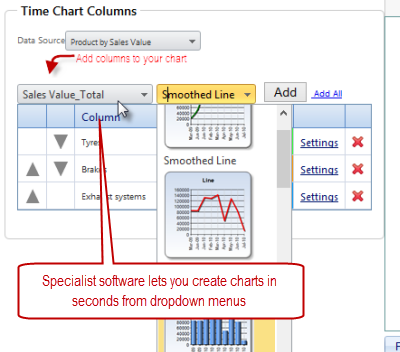 However, when using software such as Target Dashboard, each chart is presented with a convenient dropdown menu, letting you interact with the chart in seconds. While this is quite a small example, it illustrates how managers can see different data perspectives very quickly, letting them experiment with their data without having to request dashboards from tech support. When it comes to raw number-crunching power, Excel may have more potential, but dashboarding software is often quicker and easier. 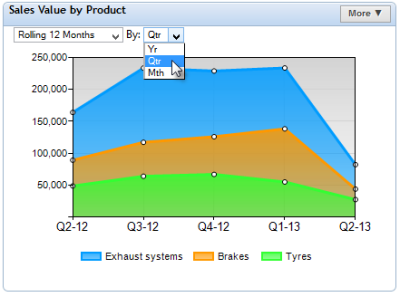 However, KPI dashboard programs aren’t just for analysing your KPI data, but also for managing it. 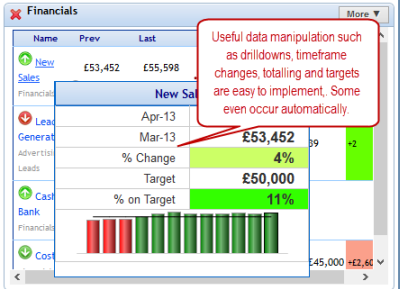 There are a few tools which specialist software offers to let you manage KPI data for decision making. It’s important to be able to easily share your dashboards with colleagues, so that crucial information always reaches everyone involved in decision-making. For example, many packages allow dashboards and KPI charts to be easily emailed directly to colleagues or other stakeholders. On the other hand, dashboard programs also let users restrict permissions on certain data tables, meaning that people with access to dashboards can be prevented from changing the data. Additionally, if you happen to be away from your desktop, your Excel files will be inaccessible. Many online dashboard providers let you access your dashboards from anywhere with internet. ii. Alerts for missing data. As it’s very important for your data to be current, you need a way to tell you if your data needs action or updating. That’s why alerting users to problem data is an important feature of many dashboard software packages. In the example above, the application notifies you when your data is out of date, so that you always know when you need to update. 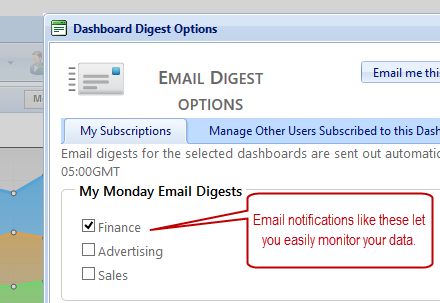 Additionally, you can set alerts which tell you if your data falls below a certain value (e.g. targets haven’t been met), which means you don’t need to check through your data manually to make sure things are going well. While I’ve seen many reports created using Excel Dashboards, these reports must be made from scratch even after you’ve created your dashboards. Specialist software lets you create reports with no effort, adding some extra information and charts to give context to your data. Because these reports follow pre-designed templates, getting your data into a well-presented paper/PDF format is far easier than arranging dashboards in Excel. 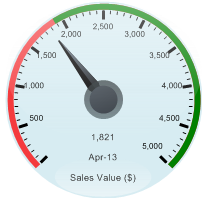 While Excel is great, Dashboard software lets you manage your KPIs quicker and easier. Excel is great for crunching your numbers and storing all of your important data. 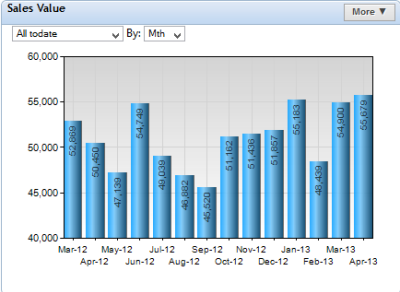 But if you want to quickly and easily visualize and manage your KPI data, a dedicated dashboard program is the way to go. Not only is it easier and quicker to get the data views and calculations you need, you can also use inbuilt management tools to stay on top of your data with little effort. 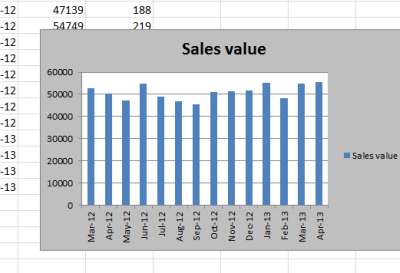 However, Excel is still great for using alongside your dashboards to store your numerical data. To see for yourself how quick it is to create dashboards from your data, why not let us take you on a free online tour (demo) with our application, Target Dashboard?